While AV used to be offered as a premium paid Value Added Service (VAS), the reduction of costs for security software and the increase in online threats have incited many BSPs to update their service models and offer AV to their internet subscribers for free. Giving your customers best-of-breed AV and security software is a win-win strategy. The customer gets peace-of-mind that they are protected from online threats. Your business benefits from higher customer satisfaction and fewer out-of-scope technical support calls due to security issues. 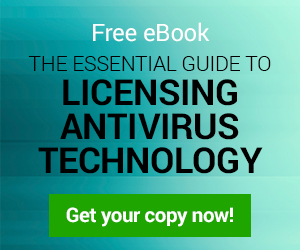 Here are 3 tips for evaluating antivirus technology. Also, check out the OEM licensing models available, to see which best suits your business needs. You’ve provided your customers with great security software and included it for free with their subscription. Great! No more costly out-of-scope technical support calls when the next wave of viruses disrupt your customers’ Internet experience… right? Providing customers great security software is only the first step. You need to have delivery methods that ensure high install and usage rates. Why spend all that money to offer your customers this software for free when you only get single digit adoption rates? Email delivery of the security software and email reminders help. However, the best way to ensure your customers are proactively protected is to schedule a remote onboarding session with them where a trained technician can walk them through the installation and configuration of their security software. These onboarding sessions work to deliver a great first customer experience and can also be leveraged to offer other VASs that your customer may be interested in subscribing to. When software, AV, browsers and Operating Systems (OS) aren’t well configured, your customer becomes highly vulnerable to threats.To help mitigate security risks, provide detailed, point-form instructions, or have a skilled technician guide your customers through safe online configurations. Educating the customer is key! If you work in the tech industry, chances are that it’s been a long time since you got excited about a lucrative offer from a Nigerian prince wanting your help to safely move millions of dollars out of his country. And, you’re probably not going to open that .exe attachment in that email you received from someone you don’t know, either. While these examples may seem like common sense, many end users may be beginners when it comes to how to protect themselves online. They may also have trouble identifying reputable security and best practice tips online. By sending your users emails, snail mail or even having service technician offer up some basic best practices, you can prevent a slew of avoidable problems before they occur. Benjamin Franklin probably didn’t know much about online threats (safe bet…) but he did understand the value of being proactive. BSPs that invest in creating seamless online user experiences for their customers by proactively protecting them from online threats, will increase the value they deliver to their end users while reducing costly technical support calls. If you are interested in VAS or Technical Support Services like the onboarding services mentioned in this article, you can learn more here. Bitdefender OEM’s guest authors will provide valuable industry views and opinions on security trends and developments, talking from their own experience within the security field and/or with Bitdefender OEM solutions.